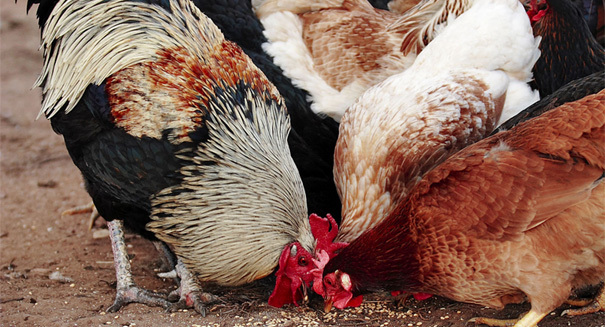 Scientists are looking for a way to stop the spread of bird flu. British scientists working to combat bird flu, have developed genetically modified chickens, and the early results are encouraging. An article on Rueters says the research, which has the backing of the UK government and the top chicken producing companies, has the potential to avoid an outbreak like the one that has caused some 48 million chickens and turkeys to be destroyed in the U.S. this year. To distinguish the genetically modified chickens from the normal chickens, the researchers have injected them with a fluorescent protein that makes their beaks and feet glow in the dark. But don’t plan to have a glow-in-the-dark Thanksgiving in the near future. Health regulators have not yet approved any genetically modified organisms (GMO’s) for use as food due to concerns over food safety and the environment. The U.S. Food and Drug Administration (FDA) has been conducting a review of GMO salmon for 20 years and pronounced it safe for human consumption in 2010. Scientists argue that GMO’s could help fight disease and increase production while consumer advocate say the GMO’s contribute to many health and environmental problems. Mitch Abrahamsen, vice president of research and development at Cobb-Vantress, owned by Tyson Foods, Inc. said the company is not supporting GMO research at this time due to lack of commercial use. The company did provide some funding for the British research team. Bird flu has been troubling the public for the past decade, because of its threat to poultry and human health, and researchers are looking at ways to control or stop the spread of the disease. Their main concern is that humans who come into contact with bird flu may become infected and spawn a mutated version of the virus that could cause a pandemic. There were no humans infected in the latest outbreak in the U.S., but cases have been reported in Asia in the last few years. A more flu-resistant bird would be a great advantage over the basic procedures that farmers use now to isolate and destroy the animals.